Hideo Suzuki has been a loser all his life, but he stands a better than average chance of surviving the zombie apocalypse. That is because in heavily gun-regulated Japan, he owns one of the few fully licensed hunting rifles. 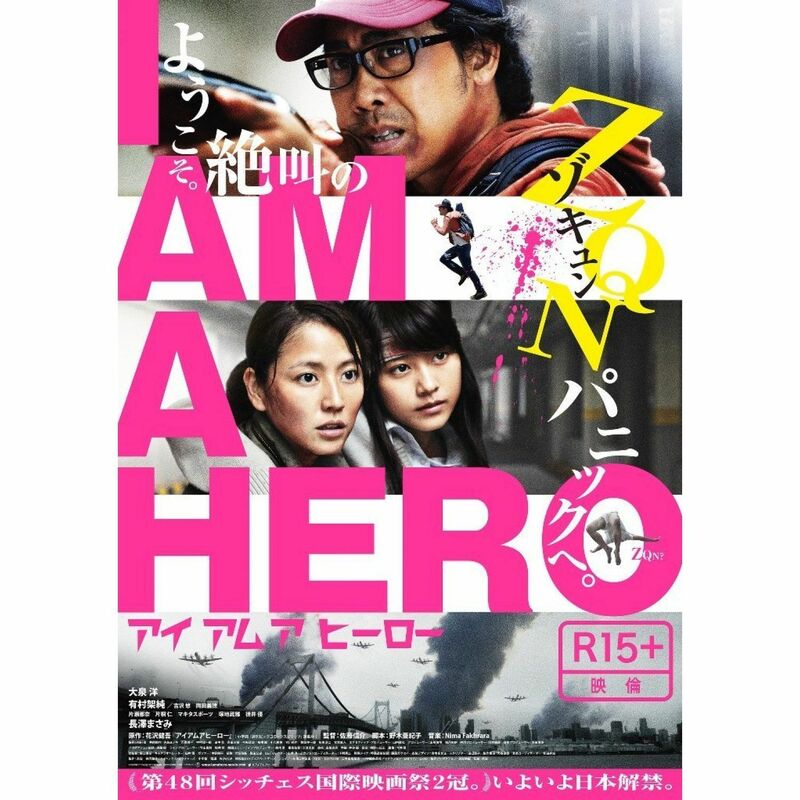 His survival and that of a teenage girl will depend on whether he has the wherewithal to live up to the heroic meaning of his name in Shinsuke Sato’s I Am a Hero. Suzuki was once a runner-up in a promising manga artist contest, but he now toils as an assistant in another artist’s manga sweatshop. Even his long indulgent girlfriend gives him the boot, but she invites him back shortly after being infected with the ZQN. Instead of a reunion, Suzuki will be forced to break-up with her permanently. About this time, Tokyo is over-run by ZQN zombies, but Suzuki manages to get to the outskirts of town with the distressed Hiromi Hayakari. Waking the next morning, he discovers she was bitten days ago by an infected infant, but has yet to feel the effects. Appointing himself her protector, Suzuki pledges to take her to Mt. Fuji, where the altitude will dispel the effects of the virus, as per the internet, which could never be wrong. Unfortunately, as she starts to fade physically (still without turning), Suzuki is forced to take shelter with a Walking Dead group of survivors encamped on the roofs of an upscale shopping plaza. There he meets the former nurse Yabu Oda who tends to the still human Hayakari. Of course, their self-appointed leader Iura, covets Suzuki’s firearm, as do those who covet Iura’s position. If ever there was a film 2nd Amendment activists should embrace, this is it. Not to be spoilery, but it spectacularly illustrates the difference an equalizer can make between survival and having your brains eaten before your very eyes. In some ways, IAAH follows a conventional Living Dead/Walking Dead template, but the third act is such an adrenaline-charged jaw-dropper, it could easily become a breakout hit with the Train to Busan audience. Seriously, this is the best zombie film we have seen since Busan, even though IAAH technically predates it. Yô Ôizumi is pitch-perfect as the nebbish Suzuki reeling from one existential crisis to another. Once again, Masami Nagasawa is terrific as Nurse Yabu. It is a forceful, complex genre performance, just like her work in Kurosawa’s Before We Vanish. Kasumi Arimura is also quite poignant as Hayakari. Indeed, their humanizing relationships will leave viewers eager to revisit these characters, something that screenwriter Akiko Nogi’s adaptation of Kengo Hanazawa’s manga leaves plenty of space for. After all, manga can go on forever. Granted, the shopping plaza setting might remind fans of Dawn of the Dead, but the tech team can boast of some distinctively disgusting new zombie make-up and effects all their own. Plus, the lock-and-load go-for-broke extended climax is sheer movie magic. Very highly recommended, I Am a Hero screens at Fantasia.